Have you ever ordered foreign currency? Just out of curiousity, have you ever ordered foreign currency? (And I'm NOT talking about those online Forex-exchange things, either.) I mean real-life currency. I recently had to do this, as part of a Christmas gift to my sister who's moving away to Sweden for 5 months. I bought her some Swedish Kronas. It was kind of a lengthy process, though, in which I had to fill out a couple of forms, and have my bank order it from the Federal Reserve and now I'm just waiting for it to be sent back. Hopefully that will be soon (they said 4-5 days typically). Have you ever done this at your bank? What was the occasion? I work in Foreign Currency 5 months out of every year. I am Canadian, and have a business and a home in Canada. I live and work there in the summer, and in the Fall I move 2000 miles to my winter home in Alamo Texas. I cannot spend Canadian dollars in the USA, and have solved this problem by having a US dollar account along with my Canadian dollar account at my bank in Canada. I do my banking on the Internet. When I need American Currency in Texas I send an email transfer. The money from the Canadian account is transferred via email, to my American Currency Account where it is changed to US Currency. Then I am able to write a cheque in Alamo and deposit it in my American account in Texas. This money can be withdrawn from the account the next day. Yes, I have done this at my local bank before. I had to switch a bunch of my money for the foreign currency because I was going on a vacation to that foreign country. It did take a while for the bank to find the foreign currency so I had to wait for it. I did it in advance when I was going on holiday. It was Australian which made it pretty easy since New Zealand is close to Australia and we have a lot of their money at banks anyway. I ordered it online, it was paid for through my bank account and I just went in to the bank to pick it up. It was really simple, although I'm sure if it was to a country less accessible it would have taken longer to get the currency ordered in. Well I have an online trading account and from time to time I do order foreign exchange to fund it so I have ordered real currency,its just that I really dont get it in my hand and I often send it of immediately and I often do it in a bank. do not have idea about order foreign currency but i exchanged foreign currency once and also need to fill the form to estate the use of the foreign currency and which place you are going to. that's not so hard and i got the foreign currency at once since i filled the form and give the local currency for the exchange. Well, I have done it a few times and the process was very simple. The first times I would go to the bank, say the ammount I want and in which currency, and wait a week for them to bring the money. Lately they added the option to ask for the currency online, and in 3 days I could go to my bank and receive it. The annoying part is having to go in person to the bank, as it only opens until 2 P.M. Yes, I have! I have ordered Euros and turkish lira. I need the Euros, because I was in Germany for 3 month and the turkish lira I have needed, just because I was on vacation in Istanbul! I never ordered foreign currency. Because I never need it to do. Actually I use payment processor which converts foreign currencies into local currencies and it is very convenient. If I would need ever to pay someone with different currencies than definitely I will use payment processor. If you do with some bank it takes little bit time to process. I know there are lots of paper work in banks for any such conversions. Wish you a happy Christmas. nope,never been in that type of situation before. Hi, Maezee! Oh, you have to order them? We have loads of foreign exchange shops at the malls, so, when I went to visit a few other countries before, I just exchanged the currency at their counters and didn't have to fill any forms. I remember when I went to Manila and wanted to exchange a couple of hundreds USD to their currency, I was required to write down the serial numbers of the bank notes in a small form. I have never done this at the bank, though. No Never I done That!But Sooner I am going to do with Mylot through Paypal for transfering the $$ into Rupees. I am lookinf forward for it. there was a time when the Canadian dollar was on par and then exceeded the value of the american dollar so i thought i would be a great idea to buy some USD. Little did i know that it would stay like that for a while and i was way too impatient and sold at the wrong time and lost money because i needed the cash. By the way Maizee has anyone ever told you you look a little like Miley Cyrus (Hanna Montanna)? I don't watch it but my sister does lol. I used to order foreign currency when I planned to study abroad two years ago. The process was not very complicated. I went to the bank and filled out a form. Then I could get the foreign currency I ordered immediately. It just took me about an hour. Personally speaking, in my country, whether the process is complicated depends on how many and which foreign currency you order. If the amount you order exceeds 50,000 US dollars, you have to wait some day for your application need to be approved by the central bank. If the foreign currency you order is not those main international currency such as US dollars and Euros, you may also need to wait some time. Yes our family experienced it ordering a foreign currency not just once but twice 1st when my sister-in-law about to leave for work in Canada & she needed Dollar, 2nd when my Brother & his child left to live in Canada with his family. It did not took us days to get the money we only waited for hours because we have a friend whi is into forex business. That sounds very interesting. I have purchased foreign currencies, but every time it was either at my bank or at the Currency Exchange counters in the city. There are a number of Currency Exchange services in the city here. Ofcourse, I have not tried buying Swedish Kronas. I don't know if they would have that readily available. Hi, maezee. I haven't personally done that because I have never had the chance to go out of our country. But I know about this fact from friends and relatives. They need to have cash in foreign currency of the country they are intending to visit. I had resigned from a foreign bank for long, I don't know now of standing regulations. I know that once, there was a limit to the amount of foreign currency (example, US dollars) that you can take with you out of the Philippines (a policy of our country). Buying price is higher than you sell it. 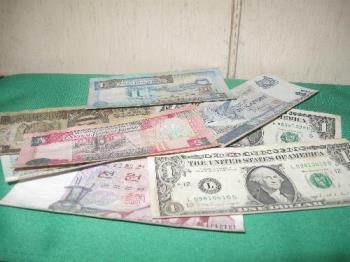 If you have foreign currency in your hand, you sell it or exchange it in say, Pesos, in the Philippines. The exchange rate would be cheaper than compared to purchasing it. This is especially so in banks. What most people do, they buy foreign currency in authorized exchange centers ... but still others buy from the "black market" ... that is what they are called. They are people who buy and sell foreign currency (USD mostly). yes i had to reserve sterling pounds for my UK stay now when I was still in the philippines. unfortunately, im running short of pounds already here on my 2nd week in UK...hahahaha!